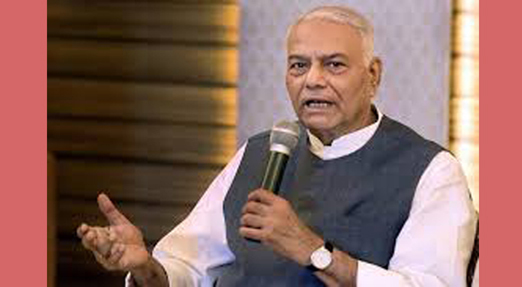 Yashwant Sinha, a former central minister and a close colleague of former Prime Minister Atal Bihari Vajpayee, will deliver deliver a talk on ‘State of the nation and the way forward’ to be organised in Guwahati on February 10, 2019. The talk, will be organised by the Axom Nagarik Samaj, as a massive public mobilisation at 10:30 am Pragjyoti ITA Cultural Complex, Machkhowa. Yashwant Sinha, who was a former Finance and External Affairs minister, is a trenchant critic of the policies of the present government. In another tweet on January 21, 2019, Sinha was vocal against blind followers of Modi. The speakers at the talk on ‘State of the nation and the way forward’ are likely to highlight the Citizenship (Amendment) Bill, 2016, which the BJP-led NDA government wants to get passed in the Parliament so that it becomes a law and other anti-people policies of the Modi government which have created unrest across the country. Despite massive protests going on across the Northeast, the controversial Citizenship Bill was passed in the Lok Sabha on January 8, 2019. The Bill is now awaiting Rajya Sabha nod. The Axom Nagarik Samaj, which has been voicing against the Citizenship Bill, has Harekrishna Deka as the president, Ajit Kumar Bhuyan as the executive president, Prasanta Rajguru as the vice-president, Paresh Malakar as the general secretary and Akhil Ranjan Dutta as the joint secretary.